this non-profit organization will armor children against drugs, crime, and violence by presenting programs of excellence while working in partnership with churches, schools, civic organizations, media, corporations, and individuals. we are a non-profit (501-c-3) foundation "armoring" children and protecting them from drugs, crime, and violence. put on your armor (sm) was founded in 1989 by "armadillo jim" schmidt. "armadillo jim" and his mascot, arnie armadillo®, have been traveling to schools, fairs, and special events for the texas armadillo association™ since 1981. in it's nearly twenty-five year history, professionally trained armadillo rangers™ have traveled internationally, speaking to and entertaining audiences totaling over several million. 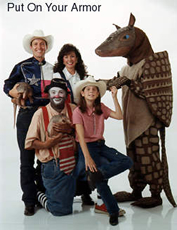 a unique armadillo show for all ages, featuring the popular "put on your armor"sm anti-drug message and the armadillo rangers.™ "armadillo jim" is available to speak at conventions, fund-raisers, churches, or any special occasion. his themes vary and may include goal setting, youth involvement, spiritual development, or comedy! 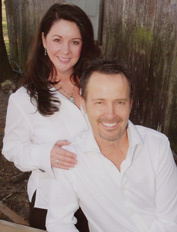 "armadillo jim" schmidt and his wife sheila bring an exciting program to equip children with 'armor' against drugs, crime and violence. "armadillo jim", sheila, arnie armadillo, august the clown, and fiona team up to 'armor' children against drugs, crime and violence.